YOR Local Medical Committee Ltd (YORLMC) is the brand name for the organisation which, through its North Yorkshire and Bradford branches, carries out the majority of work formerly undertaken by North Yorkshire and Bradford & Airedale LMCs. It is the professional voice for all NHS GPs and practice teams across North Yorkshire, the City of York, Bradford, Airedale, Wharfedale & Craven districts. You can log into www.yorlmcltd.co.uk using your FourteenFish email and password to access functions on their website such as booking on events. 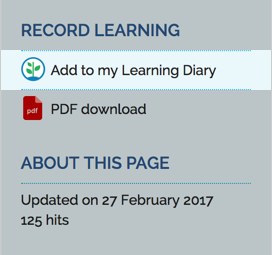 If you are reading something on the YORLMC website that you think is worth recording as CPD, just click Add to my Learning Diary in the right hand area. The details of the page as well as all the text will then be pre-populated in your Learning Diary ready for you to add your own learning points and reflection. YOR LMC are one of the many LMCs we work with. We designed and built their website and mobile app, and they use our Database system to store all their contact information and records for their members. Our system also powers their event bookings and many of their digital services.